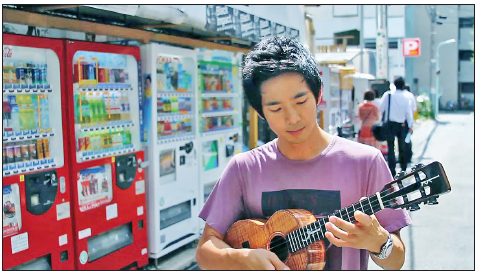 Jake Shimabukuro strums the ukulele during a trip to Japan in a scene from “Jake Shimabukuro: Life on Four Strings.” The documentary is scheduled to be shown on PBS SoCal/KOCE (Channel 50) on Friday, May 10, at 9 p.m. Directed by Tad Nakamura, the film reveals the cultural and personal influences that have shaped the ukulele virtuoso from Hawaii. On the road from Los Angeles to New York to Japan, the film captures the solitary life on tour: the exhilaration of performance, the wonder of newfound fame, the loneliness of separation from home and family. “Life on Four Strings” has been shown at the L.A. Asian Pacific Film Fest, CAAMFest in San Francisco, and other venues.